The year: 1990. The developer: American Video Entertainment. This was a company that produced unlicensed cartridges for play on the 8-bit Nintendo Entertainment System (NES) console. Included in their instruction manuals after 1990 was an entire page dedicated to explaining to consumers how they could help bypass Nintendo’s latest consoles that includes a new chip to prevent playing their games, and a somewhat martyr-tinged note of explanation that AVE sought to provide affordable family entertainment, even going so far as to offer free games with a mail-in offer. 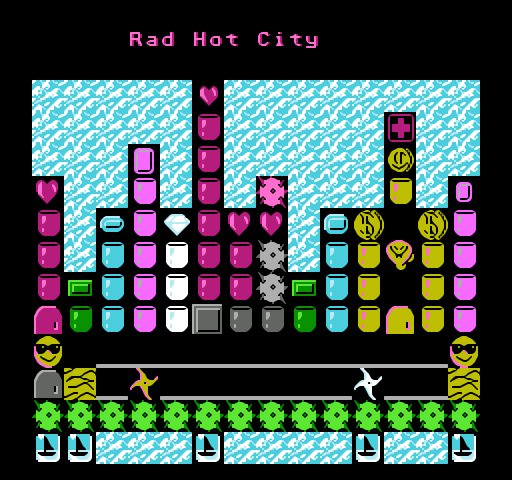 After having put such simplistic efforts like Solitaire and Blackjack onto the market, a quirky interesting game was pushed into existence, apparently thanks to the efforts of Michael and Cam Crick: Dudes With Attitude,” a frenetic action-puzzler hybrid that combined uniquely distinctive innovation with the usual pitfalls and pratfalls of small-time development operations. 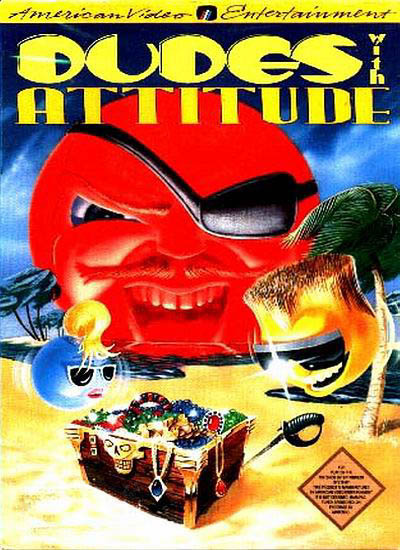 Dudes With Attitude on the NES definitely qualifies as being among that category of video games that is much more easily understood when seen in motion, rather than reading an attempt at a worded description. Truly interested readers should probably consider checking out its video entry on NESGuide.com for the full scoop to truly grasp what is going on. 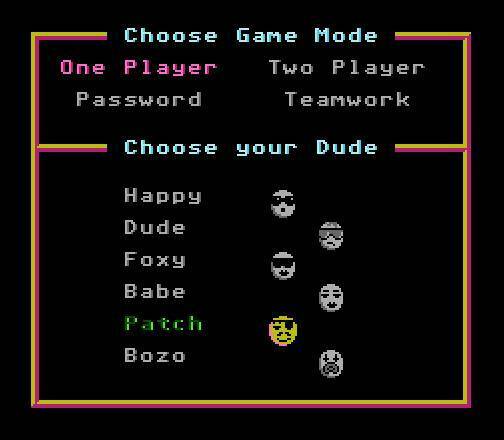 To try and summarize, though: Dudes With Attitude is an action puzzler, like a fast-paced arcade/puzzle genre hybrid. The player controls a Dude of his or her choices; these are little round head-shaped characters, who then enter play on a one-screen field. The grid-based field takes place on a black background and each level, to varying degrees, is filled with objects. The goal is to collect all the treasure on a particular stage without dying, which means avoiding static hazards and moving enemies. 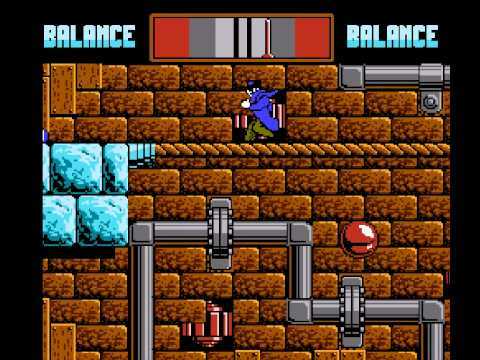 How this is accomplished is through a feat quite distinctive on the console: The Dude relentlessly moves back and forth across the screen, bouncing each time it meets a boundary or wall object, dying if it strikes a hazard or enemy twice (one “free hit” is allowed, visibly reducing the size of the round Dude), and collecting treasures. These mechanics are all done by color-coding. Certain cups on-screen change the Dude’s color as it hits them. 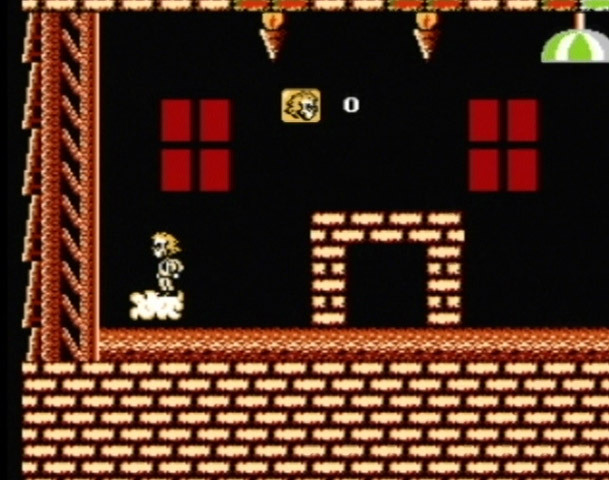 Then, that Dude is immune to enemies and hazards of that color, and can collect like-colored treasures. Remember, this is all done non-stop, as the Dude endlessly slides left and right in the field of play. So, a sample level may have a white locked door at the top third and a red locked door at the bottom third of the screen, behind each of which are its like-colored treasures, and in the center are a couple of hazards and/or enemies. In the center of the arena are the white and red cups that change the Dude’s color. 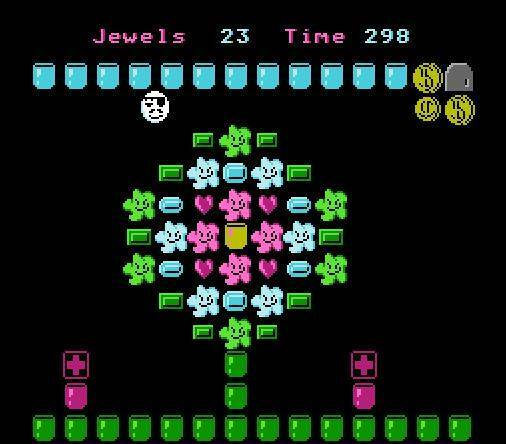 Thus, the challenge is for the player to deftly maneuver the Dude in such a way as to change to a certain color, move through the like-colored door, collect all the treasure within, then switch to the other color and repeat. However, of course, that is a very simplified explanation, and the levels rather widely vary in their imaginative varieties of lay-outs in terms of their hazards, obstacles, enemies, and treasures. There is also a password option, a level editor, and a two-player mode. 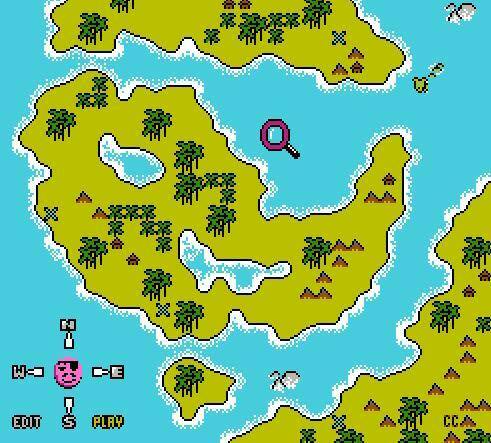 The entire experience is rather distinctive, with there being very few games anything like Dudes With Attitude on the NES; the one notable exception is Trolls On Treasure Island, which is just the exact same game, but with the licensed likenesses of Troll dolls used instead of the Dudes (with, granted, a few other palette swaps and level design changes at work), based on the popular toys of the time. The gameplay emphasizes quick thinking, requiring excellent reaction timing and rapid decision-making skills, along with a some planning in later levels, to the extent required by the fact that there is a time limit for each stage. The odd, bouncing, back-and-forth gameplay may resonate with some, but even when accustomed to, likely grows stale after a while. 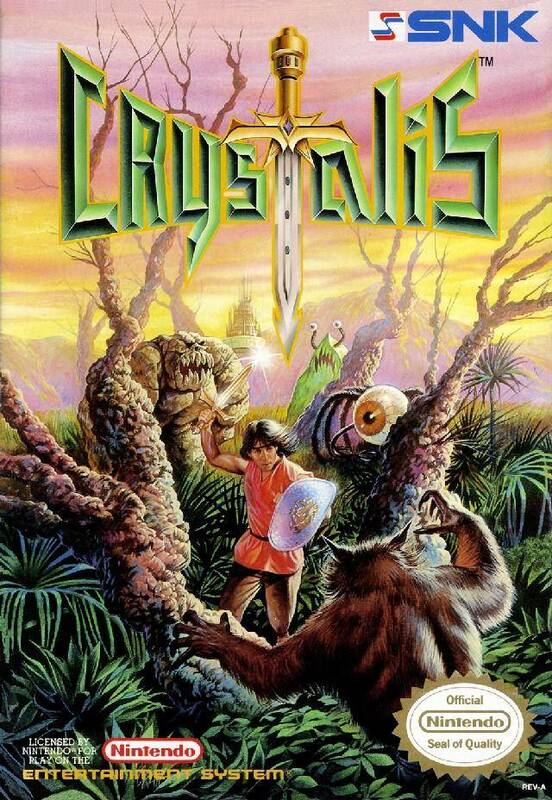 With the heavy use of blues, whites, blacks, and pinks, this looks like an old four-color CGA PC game; which, if you could not guess, is a bad thing. Granted, considering the limitations of the small icons being used here, the actual appearance of the title can be forgiven, but not by much: The elements lack detail and, though vary, remain starkly monotone. The “gum” enemies will forever just be a one-color blotch with a few pixels to denote a face, and even the treasures usually just look like crude hearts, poor bricks, or watered-down Mario Bros. coins. This is definitely a case of a video game constructed for function over form, using the bare minimum of gameplay indications to get its mechanics clearly across and not at all aiming for style points. The sound effects are simplistic buzzes and beeps; and there is virtually no soundtrack to speak of. The levels are conducted without background music, and simply jolly little ditties mark successful completions. Again: This is a small-team development job, that totally aims for just presenting a playable product, without frills or extras to speak of. Including, it would seem, any semblance of actual music. Now, strangely enough, this is actually a somewhat unique 8-bit video game. The constant, frenetic, horizontally oriented gameplay is a marked departure from the vertically oriented, slow-at-times, one-piece-at-a-time material that many old-school gamers may be used to from such classic titles as Tetris or Dr. Mario. This may serve as Dudes’ greatest strength and appeal: For a certain small niche audience, this may be just their cup of tea, and may truly be a favorite among those select few. Most, in contrast, can expect a disappointment. As unfair as it may be to those passionate coders, the end result does feels markedly amateurish, and as much as needless bells and whistles should be trimmed from some titles, this is a game that could have used some fancy additions and fine-tuned detail-worked. As it stands, it feels more like old PC shareware, something perhaps briefly played as a curiosity but at a noticeable drop in quality from the bulk majority of NES cartridges. The rating is one and a half stars out of five.